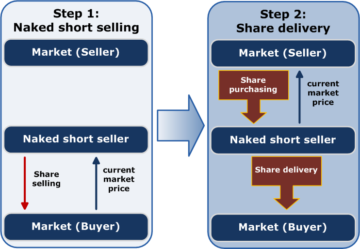 Naked short selling, or naked shorting, is the practice of short-selling a tradable asset of any kind without first borrowing the security or ensuring that the security can be borrowed, as is conventionally done in a short sale. When the seller does not obtain the shares within the required time frame, the result is known as a «failure to deliver». The transaction generally remains open until the shares are acquired by the seller, or the seller’s broker settles the trade. In 2008, the SEC banned what it called «abusive naked short selling» in the United States, as well as some other jurisdictions, as a method of driving down share prices. Failing to deliver shares is legal under certain circumstances, and naked short selling is not per se illegal. In the United States, naked short selling is covered by various SEC regulations which prohibit the practice. Critics, including Overstock.com’s Patrick M. Byrne, have advocated for stricter regulations against naked short selling. In 2005, «Regulation SHO» was enacted; requiring that broker-dealers have grounds to believe that shares will be available for a given stock transaction, and requiring that delivery take place within a limited time period. Some commentators have contended that despite regulations, naked shorting is widespread and that the SEC regulations are poorly enforced. Its critics have contended that the practice is susceptible to abuse, can be damaging to targeted companies struggling to raise capital, and has led to numerous bankruptcies. However, other commentators have said that the naked shorting issue is a «devil theory», not a bona fide market issue and a waste of regulatory resources. Short selling is a form of speculation that allows a trader to take a «negative position» in a stock of a company. Such a trader first «borrows» shares of that stock from their owner (the lender), typically via a bank or a prime broker under the condition that he will return it on demand. Next, the trader sells the borrowed shares and delivers them to the buyer who becomes their new owner. The buyer is typically unaware that the shares have been sold short: his transaction with the trader proceeds just as if the trader owned rather than borrowed the shares. Some time later, the trader closes his short position by purchasing the same number of shares in the market and returning them to the lender. The trader’s profit is the difference between the sale price and the purchase price of the shares. In contrast to «going long» where sale succeeds the purchase, short sale precedes the purchase. Because the seller/borrower is generally required to make a cash deposit equivalent to the sale proceeds, it offers the lender some security. Naked short selling is a case of short selling without first arranging a borrow. If the stock is in short supply, finding shares to borrow can be difficult. The seller may also decide not to borrow the shares, in some cases because lenders are not available, or because the costs of lending are too high. When shares are not borrowed within the clearing time period and the short-seller does not tender shares to the buyer, the trade is considered to have «failed to deliver.» Nevertheless, the trade will continue to sit open or the buyer may be credited the shares by the DTCC until the short-seller either closes out the position or borrows the shares. It is difficult to measure how often naked short selling occurs. Fails to deliver are not necessarily indicative of naked shorting, and can result from both «long» transactions (stock purchases) and short sales. Naked shorting can be invisible in a liquid market, as long as the short sale is eventually delivered to the buyer. However, if the covers are impossible to find, the trades fail. Fail reports are published regularly by the SEC, and a sudden rise in the number of fails-to-deliver will alert the SEC to the possibility of naked short selling. In some recent cases, it was claimed that the daily activity was larger than all of the available shares, which would normally be unlikely. The reasons for naked shorting, and the extent of it, had been disputed for several years before the SEC’s 2008 action to prohibit the practice. What is generally recognized is that naked shorting tends to happen when shares are difficult to borrow. Studies have shown that naked short selling also increases with the cost of borrowing. Before 2008, regulators had generally downplayed the extent of naked shorting in the US. At a North American Securities Administrators Association (NASAA) conference on naked short selling in November 2005, an official of the New York Stock Exchange stated that NYSE had not found evidence of widespread naked short selling. In 2006, an official of the SEC said that «While there may be instances of abusive short selling, 99% of all trades in dollar value settle on time without incident.» Of all those that do not, 85% are resolved within 10 business days and 90% within 20. That means that about 1% of shares that change hands daily, or about $1 billion per day, are subject to delivery failures, although the SEC has stated that «fails-to-deliver can occur for a number of reasons on both long and short sales,» and accordingly that they do not necessarily indicate naked short selling. In July 2006, the SEC proposed to amend Regulation SHO, to further reduce failures to deliver securities. SEC Chairman Christopher Cox referred to «the serious problem of abusive naked short sales, which can be used as a tool to drive down a company’s stock price» and that the SEC is «concerned about the persistent failures to deliver in the market for some securities that may be due to loopholes in Regulation SHO». In June 2007, the SEC voted to remove the grandfather provision that allowed fails-to-deliver that existed before Reg SHO to be exempt from Reg SHO. SEC Chairman Christopher Cox called naked short selling «a fraud that the commission is bound to prevent and to punish.» The SEC also said it was considering removing an exemption from the rule for options market makers. Removal of the grandfather provision and naked shorting restrictions generally have been endorsed by the U.S. Chamber of Commerce. In March 2008, SEC Chairman Christopher Cox gave a speech entitled the «‘Naked’ Short Selling Anti-Fraud Rule,» in which he announced new SEC efforts to combat naked short selling. Under the proposal, the SEC would create an antifraud rule targeting those who knowingly deceive brokers about having located securities before engaging in short sales, and who fail to deliver the securities by the delivery date. Cox said the proposal would address concerns about short-selling abuses, particularly in the market for small-cap stocks. Even with the regulation in place, the SEC received hundreds of complaints in 2007 about alleged abuses involving short sales. The SEC estimated that about 1% of shares that changed hands daily, about $1 billion, were subject to delivery failures. SEC Commissioners Paul Atkins and Kathleen Casey expressed support for the crackdown. In mid-July 2008, the SEC announced emergency actions to limit the naked short selling of government sponsored enterprises (GSEs), such as Fannie Mae and Freddie Mac, in an effort to limit market volatility of financial stocks. But even with respect to those stocks the SEC soon thereafter announced there would be an exception with regard to market makers. SEC Chairman Cox noted that the emergency order was «not a response to unbridled naked short selling in financial issues», saying that «that has not occurred». Cox said, «rather it is intended as a preventative step to help restore market confidence at a time when it is sorely needed.» Analysts warned of the potential for the creation of price bubbles. The emergency actions rule expired August 12, 2008. However, on September 17, 2008, the SEC issued new, more extensive rules against naked shorting, making «it crystal clear that the SEC has zero tolerance for abusive naked short selling». Among the new rules is that market makers are no longer given an exception. As a result, options market makers will be treated in the same way as all other market participants, and effectively will be banned from naked short selling. On November 4, 2008, voters in South Dakota considered a ballot initiative, «The South Dakota Small Investor Protection Act», to end naked short selling in that state. The Securities Industry and Financial Markets Association of Washington and New York said they would take legal action if the measure passed. The voters defeated the initiative. In July 2009, the SEC, under what the Wall Street Journal described as «intense political pressure,» made permanent an interim rule that obliges brokerages to promptly buy or borrow securities when executing a short sale. The SEC said that since the fall of 2008, abusive naked short selling had been reduced by 50%, and the number of threshold list securities (equity securities with too many «fails to deliver») declined from 582 in July 2008 to 63 in March 2009. Several international exchanges have either partially or fully restricted the practice of naked short selling of shares. They include Australia’s Australian Securities Exchange, India’s Securities and Exchange Board, the Netherlands’s Euronext Amsterdam, Japan’s Tokyo Stock Exchange, and Switzerland’s SWX Swiss Exchange. Also Spain’s securities regulator CNMV. Japan’s naked shorting ban started on November 4, 2008, and was originally scheduled to run until July 2009, but was extended through October of that year. Japan’s Finance Minister, Shōichi Nakagawa stated, «We decided (to move up the short-selling ban) as we thought it could be dangerous for the Tokyo stock market if we do not take action immediately.» Nakagawa added that Japan’s Financial Services Agency would be teaming with the Securities and Exchange Surveillance Commission and Tokyo Stock Exchange to investigate past violations of Japanese regulations on stock short-selling. The ban was subsequently extended through October 2010. The Singapore Exchange started to penalize naked short sales with an interim measure in September, 2008. These initial penalties started at $100 per day. In November, they announced plans to increase the fines for failing to complete trades. The new penalties would penalize traders who fail to cover their positions, starting at $1,000 per day. There would also be fines for brokerages who fail to use the exchange’s buying-in market to cover their positions, starting at $5,000 per day. The Singapore exchange had stated that the failure to deliver shares inherent in naked short sales threatened market orderliness. On May 18, 2010, the German Minister of Finance announced that naked short sales of euro-denominated government bonds, credit default swaps based on those bonds, and shares in Germany’s ten leading financial institutions will be prohibited. This ban went into effect that night and was set to expire on March 31, 2011. On May 28, German financial market regulator BaFin announced that this ban would be permanent. The ban is effective July 27, 2010. The International Monetary Fund issued a report in August 2010 saying that the measure succeeded only in impeding the markets. It said the ban «did relatively little to support the targeted institutions’ underlying stock prices, while liquidity dropped and volatility rose substantially.» The IMF said there was no strong evidence that stock prices fell because of shorting. In 2005, the SEC notified Refco of intent to file an enforcement action against the securities unit of Refco for securities trading violations concerning the shorting of Sedona stock. The SEC sought information related to two former Refco brokers who handled the account of a client, Amro International, which shorted Sedona’s stock. No charges had been filed by 2007. In December 2006, the SEC sued Gryphon Partners, a hedge fund, for insider trading and naked short-selling involving PIPEs in the unregistered stock of 35 companies. PIPEs are «private investments in public equities,» used by companies to raise cash. The naked shorting took place in Canada, where it was legal at the time. Gryphon denied the charges. In July 2007, Piper Jaffray was fined $150,000 by the New York Stock Exchange (NYSE). Piper violated securities trading rules from January through May 2005, selling shares without borrowing them, and also failing to «cover short sales in a timely manner», according to the NYSE. At the time of this fine, the NYSE had levied over $1.9 million in fines for naked short sales over seven regulatory actions. In April 2010 Goldman Sachs paid $450,000 to settle the SEC’s allegations that it had failed to deliver «approximatedly» (sic) 86 short sells between early December 2008 and mid-January 2009, and that it had failed to institute adequate controls to prevent the failures. The company neither admitted nor denied any wrongdoing. The Depository Trust and Clearing Corporation (DTCC) has been criticized by the Wall Street Journal for its approach to naked short selling. DTCC has been sued with regard to its alleged participation in naked short selling, and the issue of DTCC’s possible involvement has been taken up by Senator Robert Bennett and discussed by the NASAA and in articles in the Wall Street Journal and Euromoney. There is no dispute that illegal naked shorting happens, what is in dispute is how much it happens, and to what extent is DTCC to blame. Some companies with falling stocks blame DTCC as the keeper of the system where it happens, and say DTCC turns a blind eye to the problem. Referring to trades that remain unsettled, DTCC’s chief spokesman Stuart Goldstein said, «We’re not saying there is no problem, but to suggest the sky is falling might be a bit overdone.» In July 2007, Senator Bennett suggested on the U.S. Senate floor that the allegations involving DTCC and naked short selling are «serious enough» that there should be a hearing on them with DTCC officials by the Senate Banking Committee, and that banking committee chairman Christopher Dodd has expressed a willingness to hold such a hearing. Two separate lawsuits, filed in 2006 and 2007 by NovaStar Financial, Inc. shareholders and Overstock.com, named as defendants ten Wall Street prime brokers. They claimed a scheme to manipulate the companies’ stock by allowing naked short selling. A motion to dismiss the Overstock suit was denied in July 2007. A suit against DTCC by Pet Quarters Inc. was dismissed by a federal court in Arkansas, and upheld by the Eighth Circuit Court of Appeals in March 2009. Pet Quarters alleged the Depository Trust & Clearing Corp.’s stock-borrow program resulted in the creation of nonexistent or phantom stock and contributed to the illegal short selling of the company’s shares. The court ruled: «In short, all the damages that Pet Quarters claims to have suffered stem from activities performed or statements made by the defendants in conformity with the program’s Commission approved rules. We conclude that the district court did not err in dismissing the complaint on the basis of preemption.» Pet Quarters’ complaint was almost identical to suits against DTCC brought by Whistler Investments Inc. and Nanopierce Technologies Inc. The suits also challenged DTCC’s stock-borrow program, and were dismissed. In contrast, a study by Leslie Boni in 2004 found correlation between «strategic delivery failures» and the cost of borrowing shares. The paper, which looked at a «unique dataset of the entire cross-section of U.S. equities,» credited the initial recognition of strategic delivery fails to Richard Evans, Chris Geczy, David Musto and Adam Reed, and found its review to provide evidence consistent with their hypothesis that «market makers strategically fail to deliver shares when borrowing costs are high.» A recent study by Autore, Boulton, and Braga-Alves examines stock returns around delivery failures between 2005 and 2008 and finds evidence consistent with a positive link between delivery failures and borrowing costs. An April 2007 study conducted for Canadian market regulators by Market Regulation Services Inc. found that fails to deliver securities were not a significant problem on the Canadian market, that «less than 6% of fails resulting from the sale of a security involved short sales» and that «fails involving short sales are projected to account for only 0.07% of total short sales. Reviewing the SEC’s July 2008 emergency order, Barron’s said in an editorial: «Rather than fixing any of the real problems with the agency and its mission, Cox and his fellow commissioners waved a newspaper and swatted the imaginary fly of naked short-selling. It made a big noise, but there’s no dead bug.» Holman Jenkins of the Wall Street Journal said the order was «an exercise in symbolic confidence-building» and that naked shorting involved technical concerns except for subscribers to a «devil theory». The Economist said the SEC had «picked the wrong target», mentioning a study by Arturo Bris of the Swiss International Institute for Management Development who found that trading in the 19 financial stocks became less efficient. The Washington Post expressed approval of the SEC’s decision to address a «frenetic shadow world of postponed promises, borrowed time, obscured paperwork and nail-biting price-watching, usually compressed into a few high-tension days swirling around the decline of a company.» The Los Angeles Times called the practice of naked short selling «hard to defend,» and stated that it was past time the SEC became active in addressing market manipulation. In May 2009, the New York Times’s chief financial correspondent Floyd Norris reported that naked shorting is «almost gone.» He said that delivery failures, where they occur, are quickly corrected.